If you don't know about the 'Talking Ginger' app yet, you will laugh your head off! As I'm putting my toddler to bed last night, he whines and begs for the Kitty. I thought I misunderstood something in his toddler language as this is the first time I hear of this. 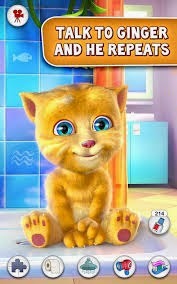 Then, our nanny brings me her iPad and shows me the 'Talking Ginger' app. She showed it to my son yesterday to distract him from the uncomfortable stretching exercises. This app is hilarious! The cutest little kitten will repeat anything you say with a kitty flair to it. Help him get ready for bed. You can also shower and hair dry him, as well as brush his teeth (encourages regular tooth brushing). Have fun with Ginger by tickling him, playing with him, listening to his cutest laugh, and much more! Even my preschooler couldn’t get enough of it. Check out the 'Ginger 2' app as well, you won't be disappointed!